In responding to U.S. President Trump's surprise announcement of a withdrawal of all U.S. forces from Syria on Wednesday, Israeli Prime Minister Netanyahu issued a brief statement that contained two messages. "This is, of course, an American decision," he said, emphasizing that it is not in Israel's place to tell its senior partner where to deploy troops. This is an important message to send, to respect America's internal decisions on the use of military force. At the same time, lacking from Netanyahu's statement was any praise for the decision, which is a reflection of a real concern from Israel's perspective over how the American exit will affect the regional balance of power. "We will study its timetable, how it will be implemented, and, of course, its implications for us," said the prime minister. "In any case we will take care to maintain the security of Israel and to defend ourselves in this area." These comments are hardly a warm endorsement. Netanyahu's statement reflects a veiled warning to the toxic regional actor that is set to most immediately benefit from Trump's step: Iran. The Islamic Republic is working hard to spread its influence, proxies, weapons and terrorism across the Middle East. Its goal is to create a network of areas under its control, filled with armed organizations, weapons factories and missile bases. Tehran wants to build these assets so that it can later use them to attack Israel, and to threaten and extort moderate Sunni states that stand in its way of regional hegemony. The American troop presence in Syria's east remains part of a "roadblock" to Iranian designs to infiltrate from Iraq. The Iranian regime and its elite Islamic Republican Guards Corps (IRGC) desire a land corridor stretching from Iran, Iraq, Syria and Lebanon. 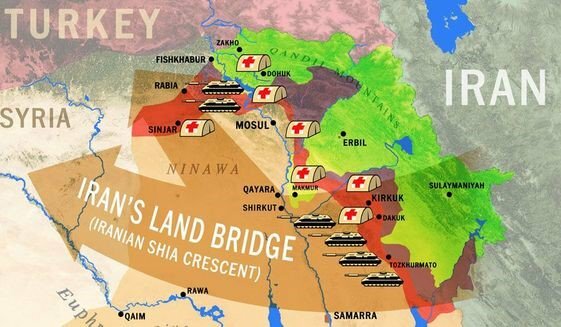 Control of such a land corridor would enable Iran to move weapons, Shi'ite militias and Iranian military formations from the east into Syria, threatening Israel and Jordan alike. The seriousness of the threat was reflected in an airstrike on July 16 of this year, attributed by international media reports to Israel. That strike targeted Iranian forces that appeared to be building such a land corridor. The strike, on a villa on the Syrian-Iraqi border, reportedly resulted in a high number of casualties among Iraqi Shi'ite militia members and Iranian officers. According to additional reports, Iran has also moved ballistic missiles to Iraq, placing them under the guardianship of Shi'ite militias, which has led to speculation that Israel may launch attacks on Iranian interests in Iraq. In August this year, a Shi'ite militia in Iraq claimed hostile drones targeted their storage facilities in an airstrike, though they did not identify the attacker. Brig.-Gen. Yossi Kuperwasser, former head of Research Division in Israel Defense Forces' Military Intelligence, said "if, especially the [U.S.] forces in the south are going to leave the area, it would mean that the [Bashar] Assad forces and the Iranians will have full control over Syria. This would mean that they may try to deliver weapons from Iran through Iraq to Syria, and then to Lebanon, and there's not going to be anything in between to stop them ... that's where the problem lies." Kuperwasser referred to American special forces based near Tanaf, which is close to the borders of Syria, Iraq and Jordan. U.S. forces are also stationed further to the north, near the Turkish border, where they work with Kurdish units. Kuperwasser, who also served as former director general of the Ministry of International Affairs and Strategy, said "it's true that the original mission, of getting rid of ISIS forces, was more or less accomplished. But the question was whether to still have U.S. troops in Syria to take care of Iranian issue or not." Asked by the Israel Project whether Tehran would be emboldened by the move, Kuperwasser responded that "the Iranians are going to be empowered and feel much stronger," adding that "it's not totally clear that the Islamic State cannot re-emerge, taking advantage of the weakening of their adversaries in this area, and they can rise again." Israel, he stressed, will take any measure it needs to defend itself and never expected the United States to protect it with forces. "That's not the issue. The issue is that we have common enemy," stated Kuperwasser. "And the purpose of the U.S. forces in Syria was to act against those common enemies--Islamic state, [who are] ultra-radical Sunnis, and secondly, the ultra-radical Shi'ites, the Iranians. The American presence over there was a major impediment in the way of the Iranians, who tried to turn all of Syria into a territory of control for them. By moving forces away, it will make it easier for the Iranians to control Syria entirely. This is not something for Israel to have a say about. It is up to Americans to determine their role." Russia, for its part, which has emerged as a bitter competitor to the United States in the region, will be "very satisfied" by Trump's decision, Kuperwasser noted, and "will have more free hand to control what's going on in Syria." Indeed, shortly after the Trump announcement, Russian President Vladimir Putin welcomed the move, calling it "the right decision." Kuperwasser pointed out that Russia has been unable to truly keep Iran away from southern Syria, despite pledges to the contrary. "They pretend to take care of Israel's concern. In the south [of Syria], they just announced again they managed to keep Iranian forces further away from Syrian-Israeli border, 100 kilometers away," he said. "But the fact is that Syrian forces deployed in Golan Heights are not totally Syrian. Some of them are actually forces that are subordinate to Iranian and Hezbollah command. And even though they have a Syrian identity, they actually take orders from the Iranians and Hezbollah. This is a situation we are very concerned about, and I don't think the Russians are doing enough to make sure that this doesn't happen," cautioned Kuperwasser. Russia has, however, stepped up efforts to convince the Iranians not to bring in weapons into Syria. If Russia can consistently reduce Iran's weapons' trafficking, it would help stabilize the region, he argued. Still, he warned, "it's a very unstable situation, and we will have to wait and see if the Iranians really behave in a way keeps the stability and quiet in Syria, and as an extension, if they turn Lebanon into an unstable area." With many question marks still up in the air, one thing appears to be clear following Trump's announcement: Russia will solidify its control over Syria, and Moscow's relationship with Israel will be even more important due to the vacuum left behind by Trump in the region. Kuperwasser offered a simple formula for understanding the dynamics of Israel's relationship with Russia. "The Russians don't want to end up facing Israeli aircraft in Syria," he said. "The way to avoid it is to make sure that the Iranians don't bring weapons through Syria because Israel won't tolerate that delivery. The best way to avoid friction is simply to convince the Iranians not to bring weapons in."